Harriet Tubman is best remembered as the former slave who also freed hundreds of other slaves by means of the Underground Railroad. She has many famous quotes about freedom and emancipation, and is one of few African American women that are still remembered for their contributions to the empowerment of African Americans in the 1800's. #1 - The Underground Railroad that she helped establish wasn’t an actual railroad. It was a network of secret routes and safe houses that Tubman used to help free slaves. 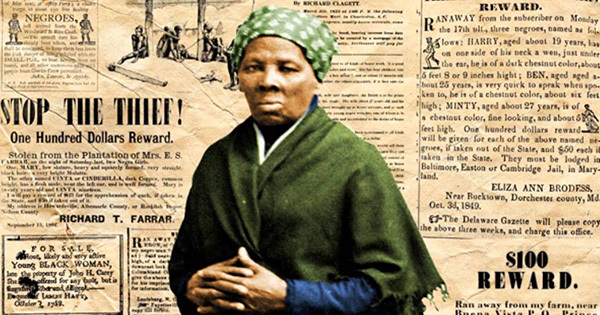 #2 - Some accounts exaggerated that Tubman freed 300 slaves, but historical documents indicate she rescued at least 70 people, including family and friends. #3 - All the slaves she rescued were in the state of Maryland, and she made 13 trips back and forth... and not one slave died in the process. #4 - She carried a small pistol with her on her rescue missions for protection against slave catchers. #5 - Harriet was one of 11 children. Her real name was Araminta Ross. The name Tubman came when she married a freed slave by the name of John Tubman. Harriet was the first name of her mother. #6 - She suffered intense headaches and seizures, the result of a head injury as a child. #7 - During her freedom missions, she carried live chickens to make her look like she was running errands. #8 - Harriet didn’t see her husband John for two years when she was on one of her missions, and he married another woman while she was gone. She later married a former Union solder named Nelsen Davis who was 20 years younger than her. #9 - After President Abraham Lincoln issued the Emancipation Proclamation, Harriet formally joined the Union cause and became a skillful and brave soldier who carried a sharp-shooters rifle during the Civil War. #10 - Harriet was illiterate, but that didn't stop her from becoming a dynamic public speaker and storyteller.